Well… sometimes I’m a little clueless. Like… sometimes I write the letters Bae.. thinking that I sound like a hip-hop kinda young’in throwin’ down a shortened slang form of the word BABE. But that ain’t correct. I finally stopped using it after my kids told me what “BAE” really meant. And then I pulled my pants and belt up over my underwear and jumped back into my minivan. But nope! I didn’t blend in at all!! 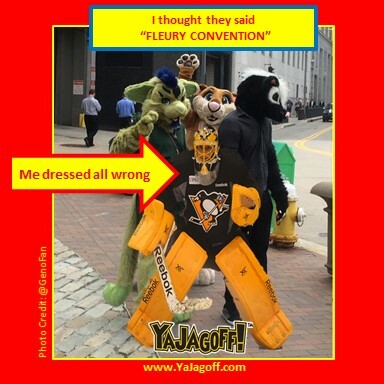 Nor did I have any idea why it was suggested that, along with my newly purchased goalie equipment, I was supposed to bring a litter pan! Well…now I have to reboot before the Anthrocon Parade tomorrow. If you’re my neighbor, I may ask to borrow your cat to stick into my pants pockets so the tails hang out. In the meantime, please let me know if anyone is currently looking for some brand-new, only used for 2 hours, custom goalie equipment, Ya Jagoffs! Thanks to @GenoFan on twitter for letting us “adapt” his photo. Grocery Store Coolers. Where’s the #@%$ Handle?